Join Parkinson’s UK for the Time to Run virtual challenge which allows participants to take part from anywhere in the world. Registration costs £12 and includes training tips, an achievement tracker and a bespoke Time to Run finisher’s medal. From 10:00 to 16:00 on Wednesday 4 April 2018 Rooney’s Boxing Gym in central London is opening its doors to those with Young-onset Parkinson’s disease (YOPD) and VIP guests. Take part in the Michael J Fox Foundation’s Shake It Off 5k run to help raise vital funds for the organisation. All levels of experience are welcome, and guests can also take on a “ninja style” obstacle course. 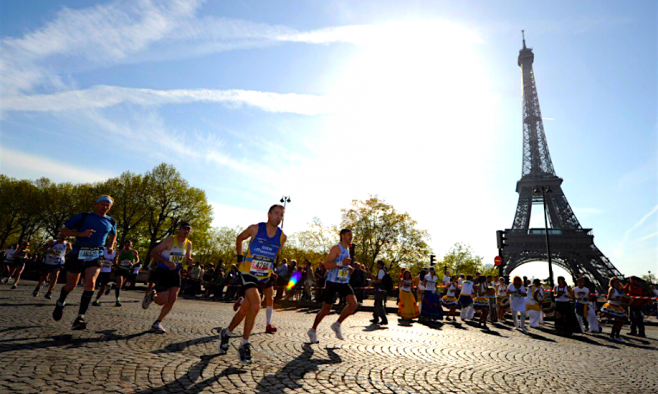 Next month the Parkinson’s UK team find themselves in the City of Love for the annual Paris Marathon. The route twists through the beautiful city – guiding runners along the River Seine and passing many other iconic locations. On the 11 April the world will come together to mark World Parkinson’s Day. Every year campaigners from the Parkinson’s community use this date to raise vital funds and awareness for the condition. You can also join the #UniteForParkinsons campaign which reached over 12 million people last year. Inspired by popular TV shows Total Wipe Out and Ninja Warrior, Parkinson’s UK has devised their own Rough Runner obstacle course. Registration costs £15. The perfect event for any adrenaline junkies out there who fancy zip sliding 230 metres across the River Tyne in aid of Parkinson’s UK. All fundraisers will receive a free fundraising pack, sponsorship forms and a Parkinson’s UK t-shirt. Parkinson’s UK are hosting their annual research lecture with talks from Dr Simon Stott and Professor Oliver Bandmann on Parkinson’s treatment. It’s free to register for the event which starts at 7.30pm. PD Warrior is an intensive exercise-based program designed to help medical professionals treat those living with Parkinson’s. The course gives an introduction to theoretical and practical skills to apply to the key concepts of the neuro-active exercises used in clinical practices. Birmingham’s NEC hosts Naidex, Europe’s largest disability and independent living event – bringing together 300 international exhibitors, 200 expert speakers, product launches, live demos, interactive features, panel debates, networking and much more. Tickets are free, but registration is required. Tee off for Parkinson’s at The Cure Parkinson’s Trust Golf Day hosted at one of Kent’s leading courses. The entry fee is £128 per player and includes coffee and lunch on arrival, followed by a full three course dinner with a bottle of wine. The Parkinson’s Society British Columbia invites you to their Shaken, Not Stirred dinner dance fundraiser at the Prince George Golf and Curling Club. Doors open at 5pm, with dinner served at 6.30pm. The 24th annual unity walk will be held on Saturday 28 April in Central Park. The route stretches 1.4 miles and includes information points where experts are on hand to answer any questions on Parkinson’s. Join Parkinson’s UK for a Sunday walk around Kensington Gardens. The walk will start at 10am and tickets cost £10 per adult, and £5 for under 16s.